If you have a piece of brisket, the Accidental Locavore knows there’s a lot you can do with it. In honor of St. Patrick’s Day and in honor of nothing in particular (maybe that I can finally access my smoker? 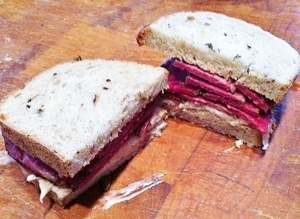 ), here’s how to take that brisket and turn it into corned beef and/or pastrami. 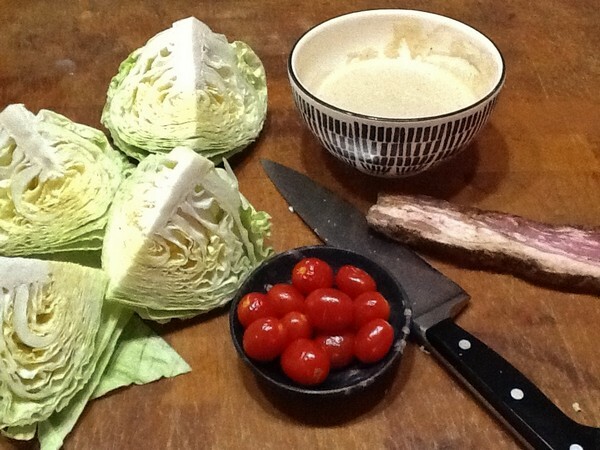 It’s very easy, you just need to give it some time to brine and if you’re looking for corned beef for St. Patrick’s Day, get to work! 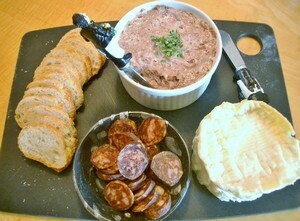 This is from Michael Ruhelman’s Charcuterie. Weights are given here, because if you have a food scale, this is a really good time to use it. If you don’t, go buy one! If the thought of all this corned beef or pastrami is too tempting, you can use a smaller piece of meat and halve the brine ingredients (but it freezes really well!). 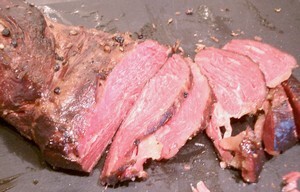 I’ve also make pastrami using beef tri-tip or lamb shoulder, both equally delicious. Combine all the ingredients except the brisket in a pot big enough to hold them and the brisket (and fit in your refrigerator). Bring to a simmer, stirring until the salt and sugar are dissolved. Remove the pot from the heat and cool to room temperature. Place the brisket in the brine, with a plate or something to keep it submerged. Refrigerate for 5 days. Remove the brisket from the brine and rinse it thoroughly under running water. Place the brisket in a pot just large enough to hold it, add water to cover the meat and add the additional pickling spice. 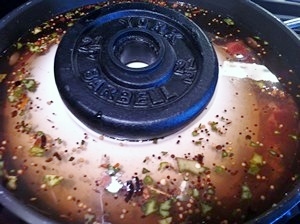 Bring to a boil, then reduce the heat, cover and simmer for about 3 hours until the brisket is fork tender. Make sure the water always covers the meat, if not add additional water until it does. 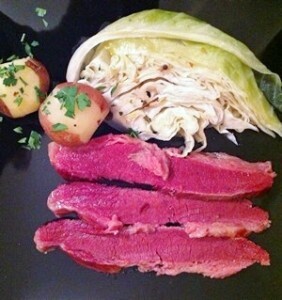 Remove the cooked corned beef from the liquid, serve and enjoy! 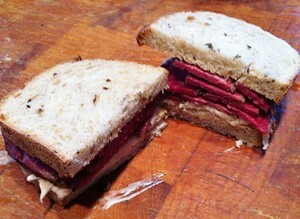 Notes: I usually forget about making corned beef and turn it into pastrami. To do that, add ½ cup dark brown sugar and ¼ cup honey to the brine. 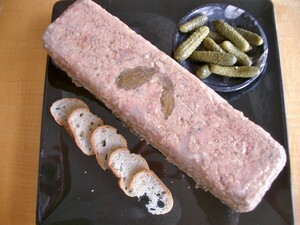 Brine the meat in the same way, but only for 3 days. Remove the brisket from the brine, rinse very well and pat dry. In a small frying pan toast 1 tablespoon coriander seeds and 1 tablespoon black peppercorns over medium heat, until they are just starting to be fragrant. Grind them in a spice mill or coffee grinder until coarsely ground. Rub evenly over the meat. Hot-smoke the meat to an internal temperature of 150°; on my smoker it’s about 4 hours. Preheat the oven to 275°. Place the meat on a rack in a roasting pan filled with 1” of water. 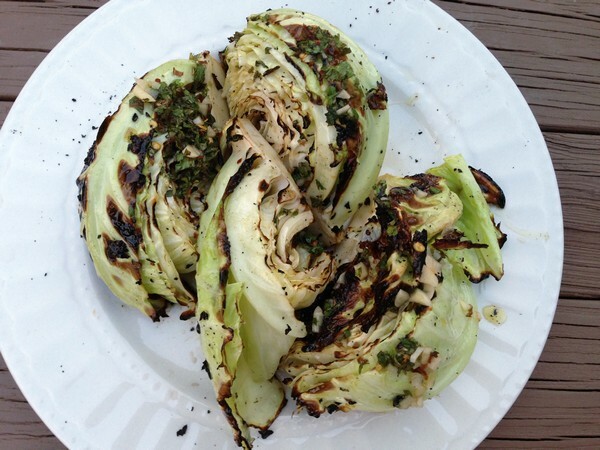 Bring it to a simmer on the stove-top, then cover with aluminum foil and cook for 2-3 hours until it’s fork tender. Serve and enjoy! *Pink salt is a curing salt and not the Himalayan pink salt you might come across. 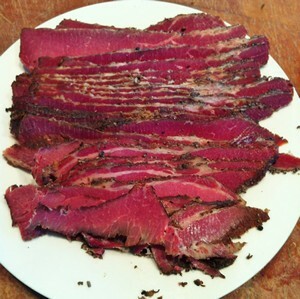 Does Grass-Fed Beef Make Great Pastrami? As you loyal readers of the Accidental Locavore know, last year I was a happy participant in the Charcutepalooza challenge. 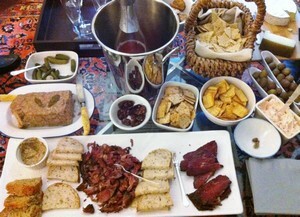 One of the enduring results was that I now fairly regularly make duck confit, bacon, pastrami, etc. And even though I haven’t done much cooking in the past few weeks (well, I’ll admit to a month), bacon and pastrami were on the menu. When we got the share of beef from Brykill Farm, I asked if it was possible to include a piece of brisket as part of the package. Susan was happy to oblige, especially because she said that no one asks her for brisket. So with this beautiful hunk of meat, I decided to make another batch of pastrami. If you have a smoker, it’s pretty easy to do, you just brine the meat for a few days, rinse it, smoke it, and steam over a water bath. More time-consuming than difficult. And the results are so worth it! No smoker? 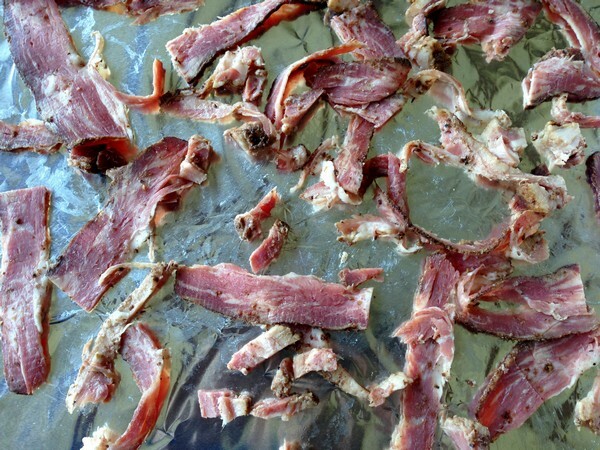 Just brine it and steam it and you’ll have some awfully nice corned beef. This piece of brisket was pretty lean and, since it’s grass-fed, a little chewy, but really flavorful. My husband likes his pastrami sandwiches with Russian dressing and coleslaw, which may be a Philly thing. 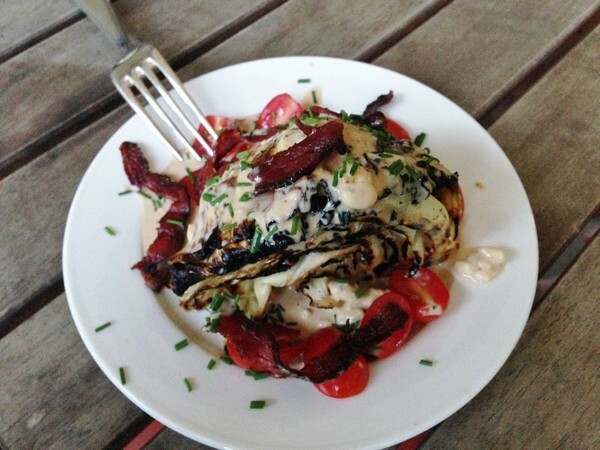 Crazily enough, although we make our own Russian dressing (including the mayo), we end up buying the coleslaw. I’m sure there’s a logic there somewhere. While I like his version, to me there’s nothing better than pastrami with lots of mustard on a couple of good slices of (seeded) rye. My die-hard New York friends would probably have a fit if they saw me smearing Dijon on it instead of traditional deli mustard, but if they complain, too bad! A couple of good sour pickles and that’s a great lunch! 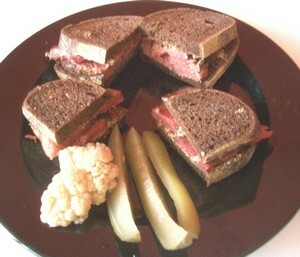 What’s your favorite way to eat pastrami? 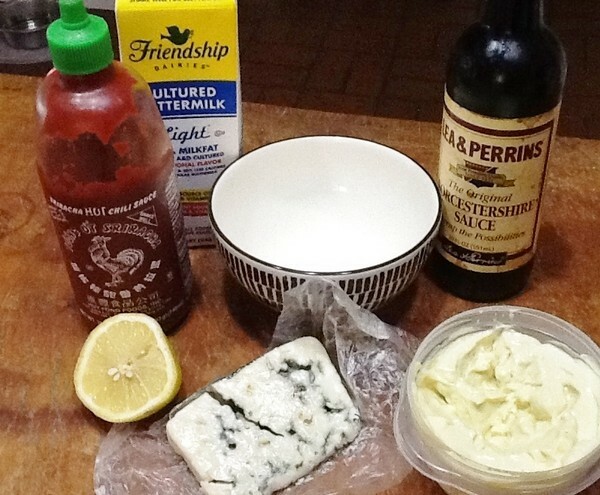 Mix well: 2/3 cup mayo, 1 big teaspoon ketchup, 2 teaspoons pickle relish (try not to get too much of the liquid, it’ll be too sweet). If you’d like a little kick to it, a good squirt of sriracha (hot sauce) and for this batch I added about 1/2 teaspoon of chopped capers.